We here at Great Job, Internet! know you have a lot of choices when it comes to seeing humorous text juxtaposed with memetically satisfying images. So we’re happy to present you with the work of writer Liz Belsky, who has taken some of the best satirical headline writing around—namely, the output of our colleagues at The Onion—and paired it with the most bloody, violent, and trendiest of trends: Game Of Thrones. Belsky has produced a pair of Tumblr entries combining these two great, bloody tastes that taste bloody and great together, with consistently amusing results. On a deeper level, The Onion’s cheerfully grim tone works really well with the darkness constantly hounding the people of Westeros. 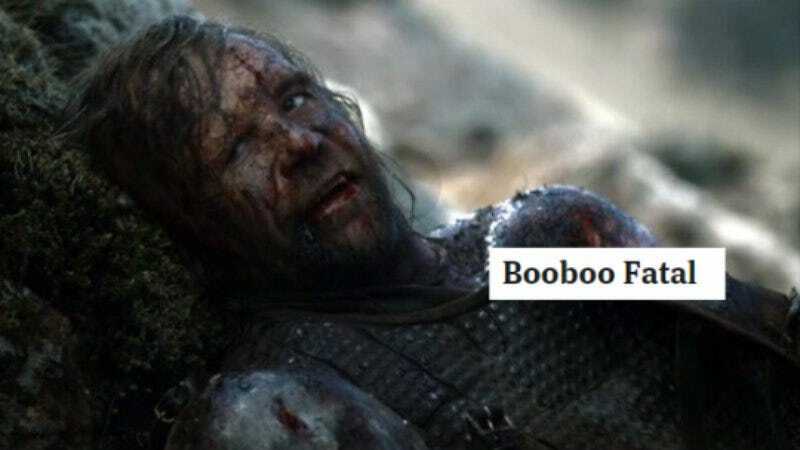 On a less deep level, it’s just funny to read blithe commentary on the awful things constantly happening to The Hound, not to mention how dangerous it can be to be an “Area Man” when the area in question is the Seven Kingdoms.